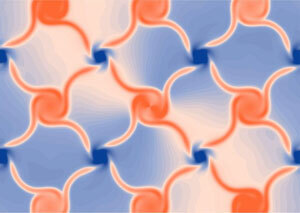 (Nanowerk News) Crystals possessing "handedness" exhibit unusual properties. New evidence suggests that they can host electrons moving like slowed down light and their collective behavior mimics magnetic monopoles. An international team of researchers has discovered that certain classes of crystals with an asymmetry like biological "handedness," known as chiral crystals, may harbor electrons that behave in unexpected ways (Nature, "Topological chiral crystals with helicoid-arc quantum states"). 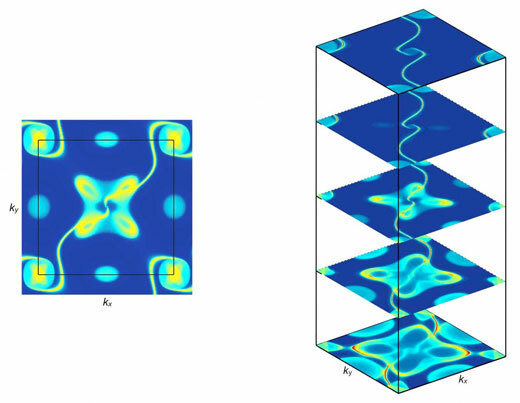 In an October 2018 article ("Topological quantum properties of chiral crystals"), Hasan's team proposed a theory that bridged the gap between the physical chirality of crystals and how electrons behave in those crystals, both quantum mechanically and according to the mathematical laws of topology. The researchers were surprised to discover that all non-magnetic chiral crystals share a universal topological quantum property: all of their electronic structures feature band-touching points governed by the Weyl equation, a quantum equation of motion. Physicist Hermann Weyl predicted such behavior of particles while at Princeton in 1929.